Compared to other manufacturing processes, the amount of pressure applied by the lamination press is low, between 0.87 and 7.3 PSI (0.06 to 0.51 kg/cm2), so start by choosing the Ultra Extreme Low (5LW) Prescale film. 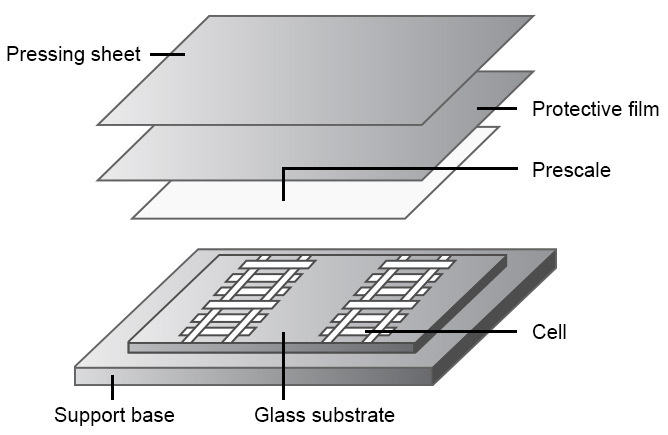 At this sensitivity level, the sensor uses two different sheets, the donor sheet and the receiver sheet, placed together on the press surface. Both sheets consist of a smooth side and a textured side. Start by placing the textured sides together so that the smooth sides are facing out. 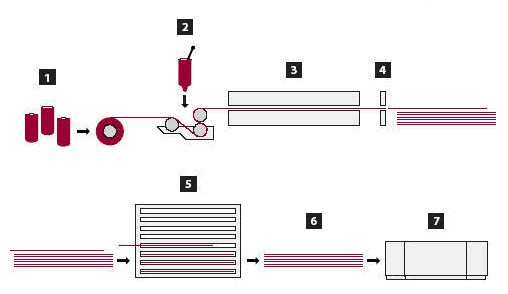 After placing the two sheets together on the contact surface of the press, apply a normal operating load to the Prescale film. Note that load duration, temperature (both surface temperature of the press and the ambient room temperature), as well as relative humidity can affect results. Once the Prescale film is removed from the press, discard the donor sheet. The pressure measurement will be displayed on the receiver sheet via the color change. Fujifilm Prescale is a pressure indicating and recording sensor film that is similar in use and effect to Litmus paper in that it takes a "snapshot" of applied pressure via a chemical reaction causing a correlated color change.. The instantaneous result displayed on the film shows only a moment in time of pressure distribution and magnitude. Fujifilm Prescale is a single use film-like material, showing only the most recent and most intense pressure in any given area. It is not reusable as it does not return to its new or unused state once subjected to any forces. Throughout the manufacturing process of solar or Photovoltaic cells, the individual cells are assembled into modules, followed by the lamination and sealing process. This consists of bonding the solar cells to the glass substrate by using a vacuum laminator. Consistent and even dispersement of pressure must be applied by the lamination press or defects such as wrinkles in the protective film, or damage to the glass, will occur. Warped Platen - The film results in this example show an area of high pressure down the center of the plate, identified by the darker red. Lighter red on the edges denotes areas of low pressure. If the plate had a convex warp, the opposite would be displayed on the film, displaying areas of high pressure along the edges. Calender rolls apply pressure by means of left and right cylinders, allowing opportunity for misalignment and balance issues between the two cylinders. Also changes in the crown of the rollers due to the high pressure constantly being applied to the rollers can cause defects similar to the above lamination press defect possibilities. Calender presses are generally used in the paper industry to add a glossed look to the paper it is laminating. The amount of pressure applied by a calender press is low, between 70 and 1,400 PSI (5 to 100kg/cm2), so start by choosing either the Super Low (LLW) or the Low (LW) Prescale pressure range. Place the sensor film between the nip rollers and apply a normal operating load. Once the Prescale is removed from the press, the pressure measurement will be visible on the film. Uneven Roll Pressure. - This example shows the result after passing the PRESCALE pressure recording film through the nip rollers, displaying too much pressure at the center of the rollers. Compare the two examples. 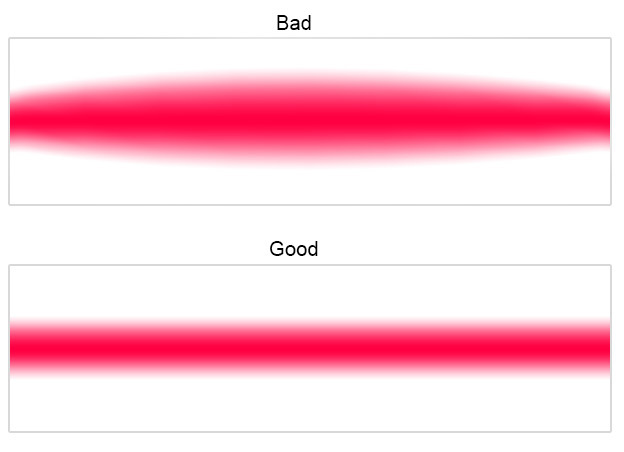 The GOOD example displays consistency from one edge to the other. Thermoset laminate manufacturing is another application where the Fujifilm Prescale can be useful. Materials such as kraft paper, mica paper, canvas, linen cloth and glass cloth undergo a high heat and high pressure lamination during the manufacturing process after being impregnated with phenolic, epoxy, melamine, silicone and/or polyimide. For short durations Prescale film can withstand temperatures up to approximately 400deg F (204deg C). Without even pressure distribution across the lamination surface, production defects will occur. Start by choosing the appropriate Prescale film range. With the high pressure, a Medium range film rated for 1,400 to 7,100 PSI (100 - 500 kg/cm2) all the way up to the Super High range rated for 18,500 to 43,200 PSI (1,300 - 3,000 kg/cm2) may be needed. Unlike the Extreme Low and Ultra Low ranges there is only one sheet needed. To start, cut the film to size and place on the contact surface of the press and apply a normal operating load to the sensor film. Once the Prescale is removed from the press, the pressure differentiations will be visible on the film. Refer to the Prescale Color Correlation Booklet and chart to further analyze the results, taking into consideration temperature and relative humidity. Digital analysis can be made using the Topaq Pressure Analysis System to get an increased visualization and statistical interpretation of the pressure variations across the desired surface area. When using the Prescale film, force measurements will vary based on length of exposure, temperature and relative humidity. Liquids and oils from skin contact can damage the film and potentially skew the outcome. It is also important to assure the proper pressure recording film is used, based on the required pressure rating, chosen between the seven available options, ranging from Ultra Extremely Low (0.87 - 7.3 PSI) to Super High (18,500 to 43,200 PSI).